Our conversion rate optimisation programme is broader than growing your revenues and improving customer satisfaction on your apps and sites. It’s about total digital product performance. What do we mean by product performance? We use quantitative and qualitative data to create insights that drive more effective decision making. This ensures your digital estate delivers results – be that purchases, enquiries or better user engagement. Our specialists are integrated into our product teams alongside designers and developers. This means we have a holistic view of the full customer lifecycle, from acquisition through to retention and repeat purchase. This knowledge and collaboration mean that more often than not, we can improve the overall velocity of your digital workflows, delivering results faster and with more quality. In our experience, this approach can deliver much more than just lucrative site design changes – they can reinvigorate your business strategy too. Customer expectations evolve quickly. So should your site. Without the help of our specialists, your site risks becoming stale and irrelevant. Only by listening to your customers’ views and behaviours can you offer market-leading customer experiences. That’s what a first-class conversion rate optimisation programme like ours gives you. The best companies evolve their digital offering to make their online experience better. With our help, you can do that too. Do the right thing – We do the things which deliver the most value or uplift soonest. And, unlike most conversion rate optimisation agencies, we’re tool agnostic. We work with the tool that best suits you. Others shoehorn your website optimisation programme into an unsuitable tool which suits them. Do the thing right – We’re user-centric and we’re scientific. First, we analyse your web analytics data and your customers’ behaviour. Then, we create hypotheses for improving your site’s performance. Finally, we test those hypotheses by running design experiments on your site. Data drives everything we do. Do it together – Websites can suffer from a lack of coordination and a narrow range of viewpoints. A marketer makes one change, an agency makes another and before too long, it’s a mess. Code takes a different approach. 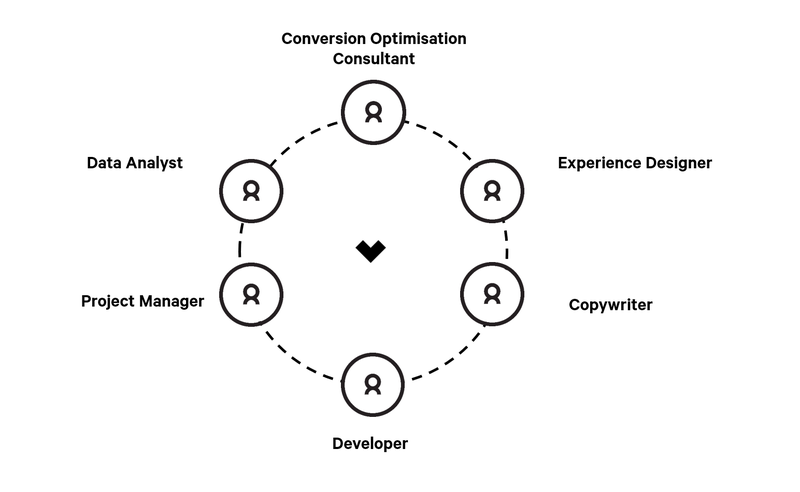 Our conversion optimisation consultants form part of our multidisciplinary teams, which act as an extension of your team. Our design decisions are therefore based on a diverse range of perspectives and expertise, rather than one person’s opinion. This leads to far better results. Unlike conversion-only agencies, our conversion optimisation activity draws a much wider range of digital specialists. Our teams consist of UX designers, strategists, copywriters, software engineers, front-end developers, product owners, and more. We come as one package. This diverse range of viewpoints ensures better results. We’re also part of Mediacom North. Being part of Mediacom North means we can access channel specialists throughout the customer journey. From off-site acquisition through to on-site conversion and retention, we offer wide-ranging expertise. We have a long track record of delivering results. Our team has generated £100m+ in revenue for over 50 clients. Problem: convincing web visitors to commit to making a new or used car enquiry in a competitive market. Solution: We put consumer insight at the heart of the strategy and tactics – using data and insight to drive the right strategy. Then, we began testing and learning to maintain optimum results. This programme of activity involved 16 split tests in total over a 12 month period. "Code have changed the way JCT600 works. There is no internal fight any more on what we should be doing. Now everything is for a reason and justified."